Although not the biggest update in the iOS ecosystem, the iOS 8 is announced with the best upgrades from the previous iOS version, and there are a lot of additions and improvements to the features that are already present in the iOS 7. 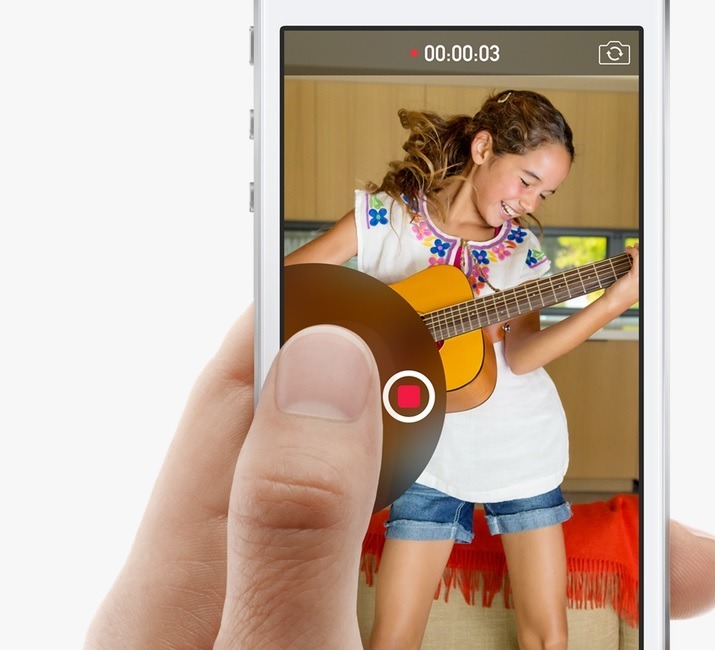 Apple called the iOS “Huge for developers. Massive for everyone else”. Before we jump into the detailing part about the iOS 8, here are some stats about the number of iOS devices that are shipped till date. In the last one year, 130 million customers were newly added to the Apple’s community, buying their first Apple device. When Apple announced iOS 8, initially there wasn’t much excitement because Apple didn’t call it the best, unlike last year when they announced the iOS 7, but when we look at the whole big list of features and improvements, there’s a lot to explore. 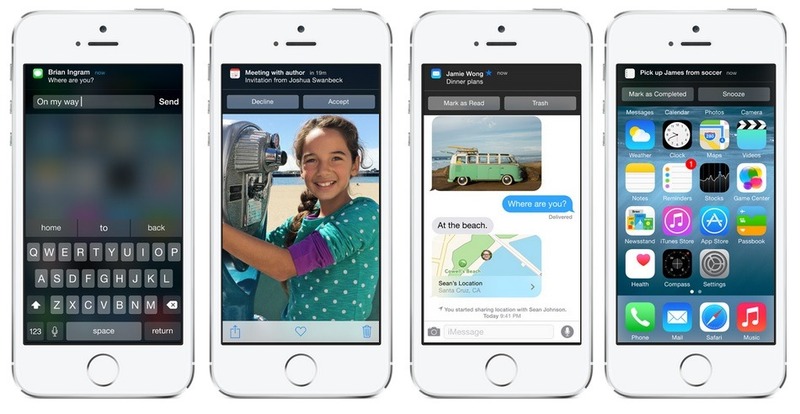 Check out below for the different features in the iOS 8. 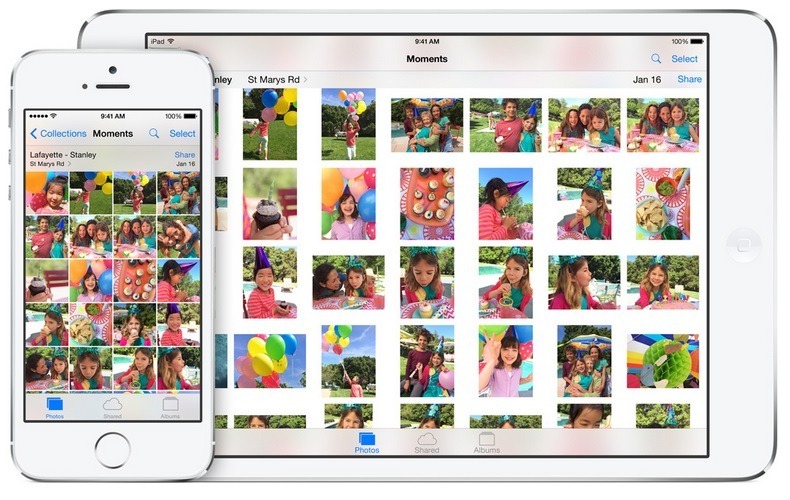 The new Photos app makes it simpler to find and discover the photos, and the iCloud Photo Library now includes more syncing, where all the albums and photos can be carried in all the iOS devices you own. There are editing tools included, and to make a capture look better on the iPad, you could take a photo with your iPhone and just leave it there, and the iCloud Photo Library would automatically sync it over the devices. There’s a lot of changes that you get to see in the messages, i.e. in the iMessage app where earlier it was just the standard SMS sending and receiving that was possible, but now one could do more than that. Here’s the list. 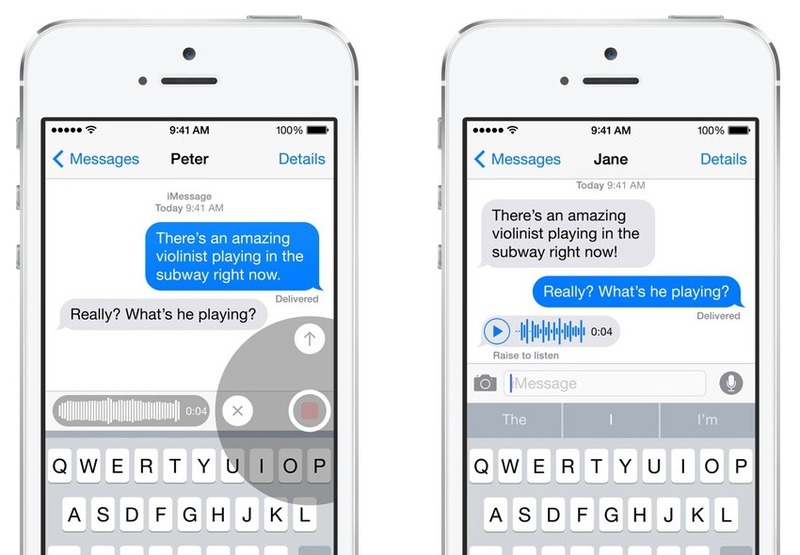 Adding voice to the conversation: you could simply touch and hold the microphone button to record the voice, song or sound and swipe to send it to your contact. Listening the voice message is intuitive – you could either tap the play button, or lift the iPhone to your ear to listen it like a phone call. Video message: The new feature would let you share whatever you watching, i.e. sending a video by capturing it right from the iMessage app. 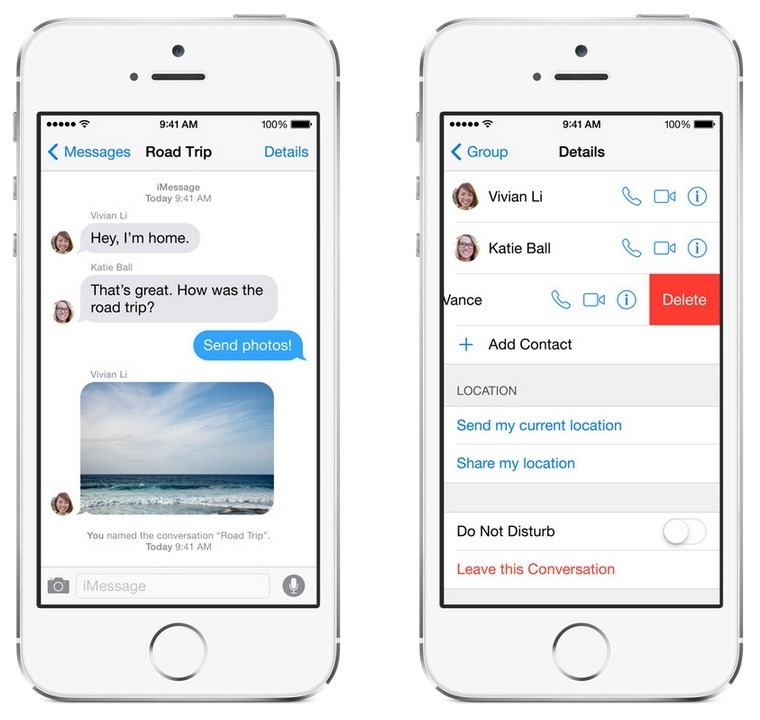 Group Messaging: What was earlier a part of the third party apps, is now seen in iMessage. Create a group conversation, include any of your friends, drop anyone you don’t want to have, leave the conversation or turn the Do Not Disturb mode On anytime you want to read it only when you are free. You could also share your location in the middle of the conversation, where the direct link to the map is provided. Viewing and Sending Attachments: Attachments could be sent in bulk. 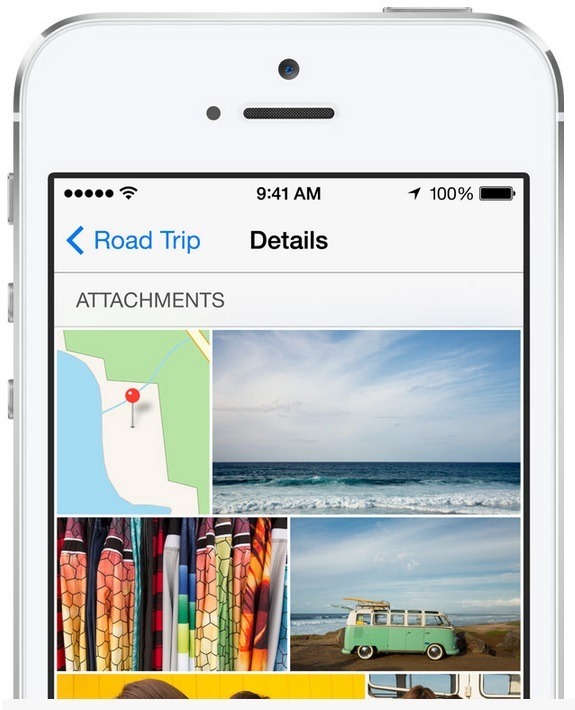 Multiple photos and videos can be selected from the camera roll and sent. If you are a part of a very long conversation, there is a direct link to Attachments where you get to see all the sent and received photos and videos, rather than having to scroll through the messages to find any. The new keyboard in the iOS 8 has been made a lot better, where the inclusions are – the predictive text, language support and third party app support. Predictive text: The iOS 8 predicts what you are likely going to type next, and that doesn’t depend on the contact you are in a conversation with. 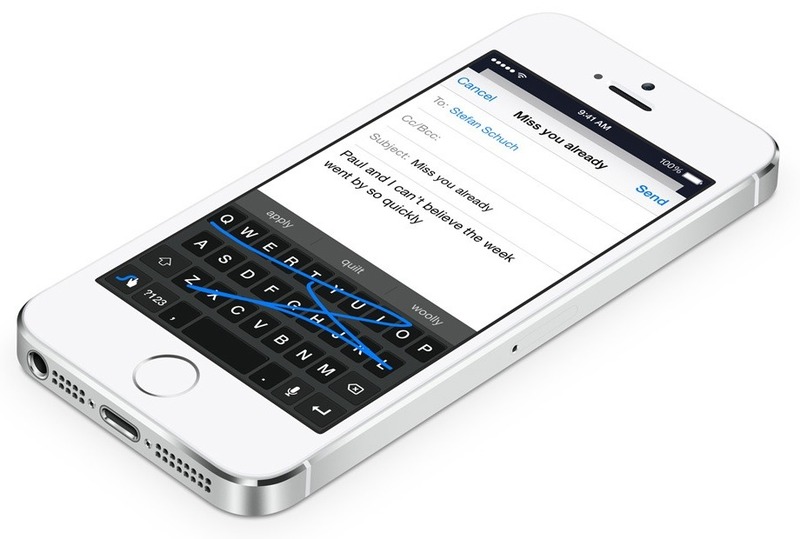 Based on the past conversations and writing style, the keyboard tries to suggest the words and adjusts itself based on the person you are communicating with. Language support: The predictive text engine is optimized for 14 countries, and based on the region, the words and phrases are suggested if its the place which is in the list. Third party keyboard app support: This is for the first time that Apple is open to developers who wanted to develop and make the personalized special keyboard apps available. iCloud Drive is a new feature from Apple, where you would be seeing all the iCloud enabled apps taking advantage of this, and it helps in seamless syncing among the various Apple devices. 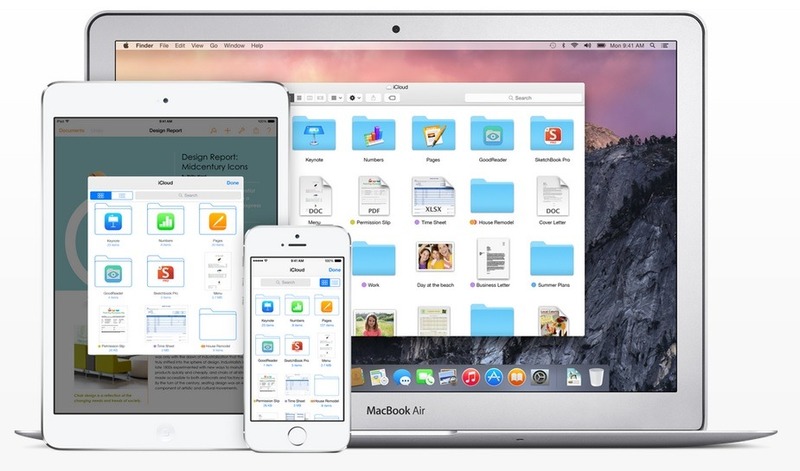 Here’s a few features of the iCloud Drive. 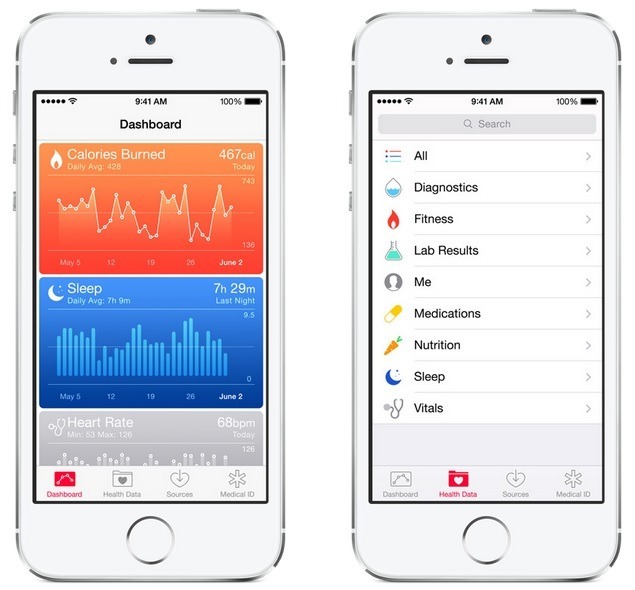 Apple has included a new health app in the iOS 8, and this app gives you a dashboard to track the health and fitness data. The HealthKit tool for the developers would help them create health and fitness apps to work for some better apps in tracking the fitness status. The health app takes the data from the different sources and keeps a track of the heart rate, calories burned, blood sugar and cholesterol levels. A Medical ID can be created with the conditions, medical note, allergies and reactions, medications etc. and this can be accessed easily. The health app is already syncing with several fitness apps, and there would be soon some support seen from Mayo Clinic for better health management, sharing the health stats with the doctors. The spotlight search takes the location and context into consideration while trying to find what you are looking for. The spotlight search pulls data from Wikipedia whose small snippet is shown if something relevant is being searched and the data is available on Wikipedia, and it also searches in the hot news, nearby places, iTunes Store, App Store, iBooks Store, Suggested websites, Movie showtimes. The same search works even in the Safari browser where the results appear alongside the Top Hits and search suggestions. 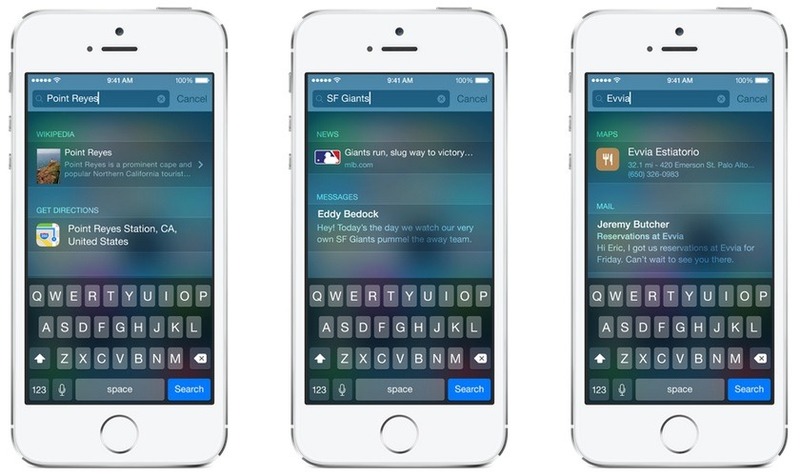 Earlier in the iOS 7, the notifications were just standard and shown in the notification center. Now, these notifications have become interactive, with the option to take action on them. You could reply to text messages, emails, calender invitations, reminders and the messages from the third party apps. The best part about this, is that you don’t have to leave your app while trying to respond to the notification. The mail app has been made even more streamlined, better and easier to use. Now, you can jump between an email in your inbox and a draft. A swipe is needed to keep the draft in the bottom, while you browse the inbox for some other mail from where you are copying some text. 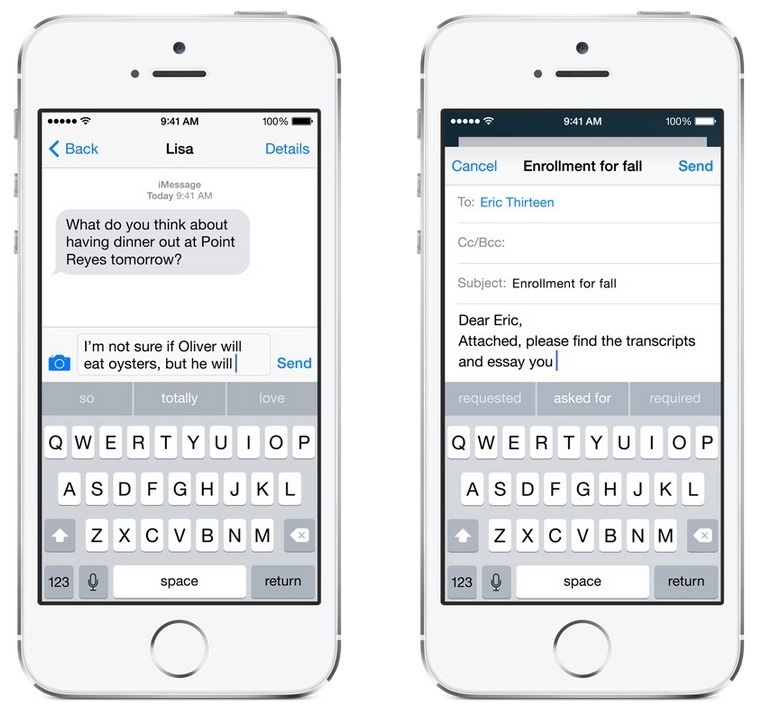 The Mail app recognizes any reservation, flight confirmation or phone number in an email. For anything of such kind, a notification is received and you can easily add that event to the calendar, or a phone number can be saved in the contacts. Swipe right on the mail list tab to mark the mail as unread, and swipe left for more options such as Flag, Trash or Archive. When pressing the home button twice to see the multitasking interface, now the user would be able to see the recent contacts and the favorites, apart from the apps which are currently running. The look of the app previews is the same as before, but the contact faces is something new, making it easier to access the recent and favorite contacts. The tab view that was seen on the iPhone is now available on the iPad too. The grouping in the tabs is possible, and there’s also a new sidebar which would slide out to reveal the bookmarks, the reading list and shared links. This is a new feature where up to six people in the family can share the purchases that are made from iTunes, iBooks and the App Store without sharing the account details. Using the same credit card, one can pay for the family purchases, and the sharing of photos, family calendar is made easier with the Family Sharing feature. Finding the lost devices, searching for the location of the family members in the Apple Maps is all possible. The iOS 8 is going to be available during the fall, but the beta versions would be available for the developers to try it out and check the compatibility for their apps and such, and the iOS 8 Beta 1 is available right away for the compatible devices. The supported devices for the iOS 8 include – iPhone 5s, iPhone 5c, iPhone 5, iPhone 4s, iPad 2, iPad with Retina, iPad Air, iPad Mini, iPad Mini with Retina, iPod Touch 5th gen.